Drew Stafford should have felt right at home. It was a scenario he knew all too well: hitting the road, going from city-to-city to play in front of thousands of screaming fans. But this time, it wasn’t hockey players the crowd came to see. And it wasn’t Stafford who was preparing to perform. Instead, the winger had the unique opportunity to be up close and personal with one of his favorite bands as Every Time I Die hit the stage on Warped Tour last week. As a musician himself, Stafford has been the guitarist for two bands – Invisible Children and Red Seal Peach – which he still is involved with. But it was a more recent performance that caught the attention of members from Every Time I Die. Appearing with Irish Tenor, Ronan Tynan, and the Buffalo Philharmonic Orchestra in December for a charity concert, Stafford and teammate Ryan Miller were interviewed about playing on stage. Before long, they invited the winger to join them on the road. “I met them in Chicago last week, hopped on the bus with them and drove to the next show,” Stafford said. “I told them about how I have my band and how I am trying to record and get my stuff out there… But it was more of just being there, being around that atmosphere and seeing how it is, that lifestyle. 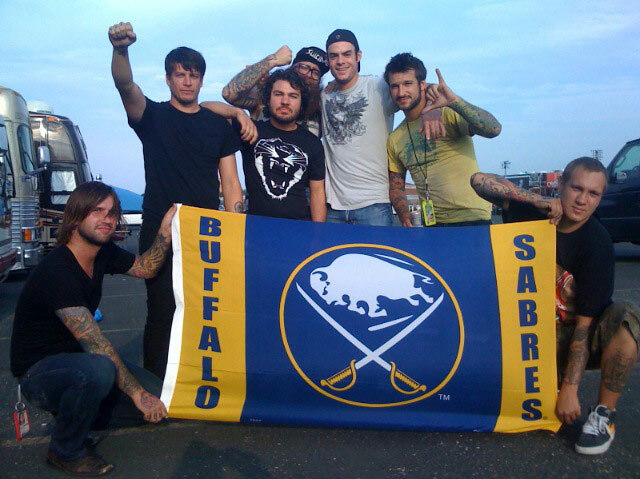 Their mutual love of music is not the only thing they share as both Stafford and the band members both call Western New York home. While the skills required for each profession are considerably different, Stafford found that the life of a musician is not unlike the life of an athlete. From being on the road for long periods of time to interacting with fans and fanatics, some parallels were drawn between the two vocations. “Everything is the same. It was one of the jokes we had, how similar they are,” he said. “With the Sabres, we are a team. We are on the road together all the time, hanging out and working together with our fans supporting us all the way. With the band it’s the same exact thing. They are experts at what they do… and have to perform at their top level and have fun with it.